Witnesses to a 50-strong brawl after a boxing match which left 11 people hurt are urged to come forward. 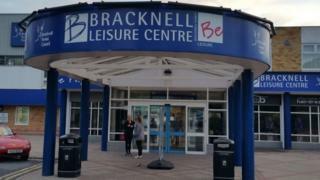 The fight erupted between a "large group of spectators" outside Bracknell Leisure Centre on 17 March. Thames Valley Police said members of the public and staff were attacked, describing the behaviour as "unacceptable". The offenders were described as a group of both black and white men ranging from their late teens to their 50s. Many of those injured, whose ages ranged from 21 to 49, required hospital treatment. Investigating officer PC James Doel said a small black car was seen leaving the scene "at speed" as the emergency services arrived at about 22:30 GMT. He urged anyone who saw the "large affray" to come forward. "This was an incident in which members of the public and security staff at the venue were attacked, and this behaviour is clearly unacceptable."